1. Marinate the prawns with lemon juice and salt. 2. Combine the ground paste with potatoes and keep aside for 60 minutes. 3. Heat oil in a pan over moderate flame. 4. Saute the garlic, green chillies and curry leaves. 5. Add the potatoes and cook for 3 to 5 minutes, stirring often. 6. Pour some water to cover the potatoes and reduce flame. 7. Cover the pan and simmer for 45 minutes or till potatoes are cooked and a thick gravy remains. 8. Add the prawns and increase flame to medium. 9. Cook for 2 minutes and add salt. 10. Stir and garnish with coriander leaves. 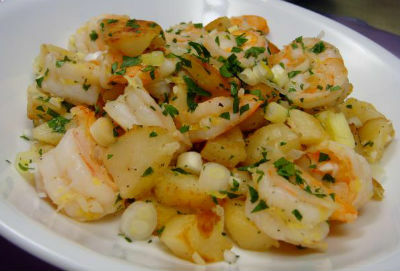 Feel free to comment or share your thoughts on this Parsi Prawns with Potatoes Recipe from Awesome Cuisine.